…but slowing down for a while. This part of our adventure finds us in the sunny (and currently record breaking cold) state of Florida. With the RV in storage, and our family moved into a house, we plan to stay put for a while. And while my children have not complained once about sleeping arrangements on this trip, I am happy to report that each of them now has a bed to sleep in. We still plan to have plenty of adventures, but will (for the most part) stay within this state for the next three months. Some of our most valueable memories along the way are of people, rather than places. 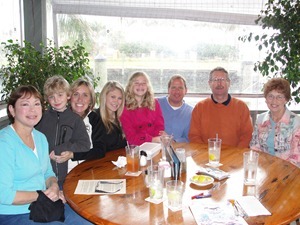 This week, while we were staying in Nettles Island, we got to spend time with some dear friends, Jim and Lisa Favors. We met Jim and Lisa when they arrived home from their first “Great Loop” boat trip. After discovering they were doing something we had dreamed of, and following their travel blog for months, we felt like we knew them well before we got a chance to meet them face to face. They are currently on their second “Loop’ and whether it is dinner at the dock, burgers at anchor, a weekend get-away or a brief visit, we always enjoy their company. If boating is a passion of yours, you might find their books, magazine articles, and photos valuable resources. You can follow their journey at favorsgreatloopblog.com. And no day is complete without chocolate…right? 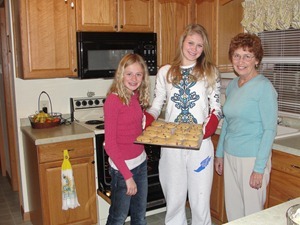 Grandma and the girls baked chocolate chip cookies for our last night at Nettles. Grandma (or Mother Theresa as Scott has fondly nicknamed her) has proclaimed herself the “Home Economics” teacher for our extended stay in Florida, and has every intention of following through on that promise! 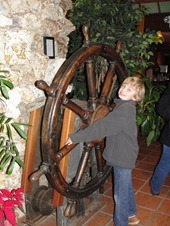 This entry was posted on Tuesday, January 12th, 2010 at 12:35 am and is filed under Florida. You can feed this entry. Both comments and pings are currently closed.